My introduction to Filipino food is the way I wish I could be introduced to all cuisines: a massive neighborhood potluck, 20-plus dishes, all cooked by moms, aunties, and grandmas. I was literally dragged from dish to the dish by its creator. Foods were spoon-fed to me by strangers like I was a child. It was life changing. As I was stuffing my face in Singapore, Filipino chefs in the U.S. were gearing up to open the restaurants and food trucks we all know and love today. Places like Rook in Indianapolis, Bad Saint and its 4+ hour lines in D.C.
And, of course, Guerrilla Street Food here in St. Louis. You know I love GSF's burger. I'm there when they have lechon. Now they've launched the Guerrilla Alliance series—the GSF crew teams up with Filipino chefs (both professional and amateur) to help give St. Louis a glimpse of what the cuisine can be—and I plan on being at every one of those, too. The first collaborative dinner was with Nowell Gata, formerly of Small Batch, now the exec chef at Tin Roof. The chefs created a 6-course tasting menu, with most of the dishes representing one of Gata's immediate family members. The first course was tuna kinilaw—raw tuna drizzled with a mix of coconut milk and cane vinegar—inspired by trips to the beach with his mom. Sinigang na Hipon, his sister's favorite dish, followed. The traditionally sour soup was kicked up a notch with local radishes and greens, plus shrimp butter. My favorite course of the evening was brinner: all his dad's favorite breakfast items (and mine too) put together. Guerrilla's arroz caldo—which tastes exactly like I remember it from Asia—plus freshly made longaniza sausage and a fried quail egg. If this was on the GSF menu, I'd get it every time (HINT HINT, GSF). Hardesty sent out a wildly delicious handheld amuse that I wasn't able to get a picture of: a prawn cracker used as bowl, then filled with squid ink and a fried sardine. 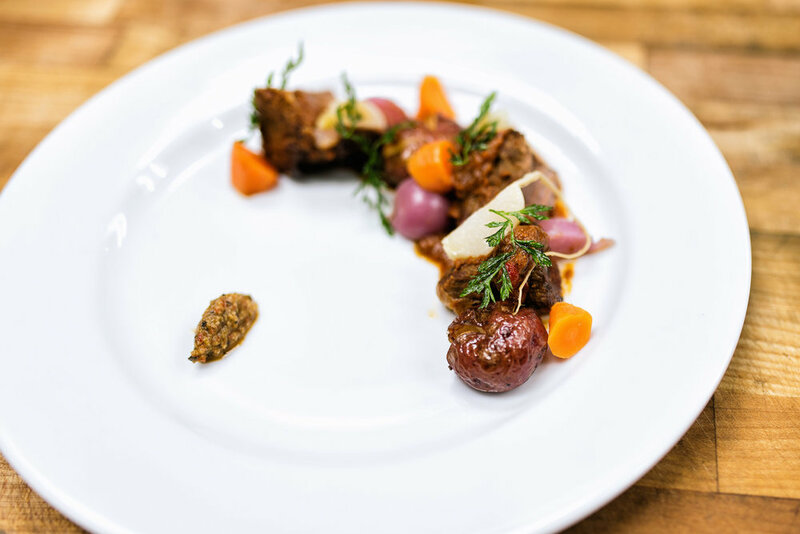 As soon as that went down the hatch, Gata's final entree, an ode to his brother, arrived: beef Kaldereta, which is essentially Filipino beef stew. The evening came to a close with one of the most delicious desserts I've had in months: Halo Halo. But, of course, not just any halo halo. A ginger custard base was topped with a 4Hands Contact High granita and a few slices of green mango. This coming Sunday, May 28th, Nudo's chef, Marie-Anne Velasco, joins GSF for their second Guerrilla Alliance meal: all the noodles. You can find more details here.